Macaulay: Please tell us how you would describe your family? Karen Padawer: We are an eclectic family with lots of artistic juices. Our children are both writers and everyone plays an instrument: I play the bassoon; my husband, Nathaniel Solomon, plays the accordion; Karla plays the clarinet; and our son, Gabriel, plays the trumpet, piano and guitar. We are also a Queens College family – in addition to Karla, Nathaniel went to Queens College, and Gabriel now goes to Queens College as well. M: What is your daughter studying at Macaulay Honors College? KP: Karla went to Macaulay at Queens College as a psychology major, but she’s navigated a lot of tangents, including music therapy with autism. She’s taken a lot of dance classes as well as Balinese percussion. Her playwriting class has led her to apply for an internship in a New York City theater. She is also strong in languages, pursuing minors in Spanish and linguistics, and working in the writing center with non-native English speakers. M: Has your daughter found any unique opportunities at Macaulay? KP: Karla used the Macaulay Opportunities Fund to study Spanish in Madrid. She competed in local poetry slams and found herself adopted by the literary community. She was exposed to so many things in Spain. It’s a 50 minute walk to a synagogue where she met with women exploring their Sephardic roots. They are converting to their ancestor’s religion, and Karla, who was raised an Orthodox Jew, was fascinated by their stories. Having an advisor in her corner has really been helpful. Through her honor societies, she met Dr. James R. Steller, who was Provost and Professor of Psychology at Queens College. He has become her mentor and will continue advising her on her future. Karla has many opportunities ahead of her. She is a finalist for a Fulbright Scholarship to teach English in Spain. M: What has been your role and experience as a Macaulay parent? KP: As a parent, you are there to encourage your children to try on anything. You encourage them to take risks and explore. Karla has had the opportunity to forge lasting bonds with her professors, administrators and the staff that will take her places. 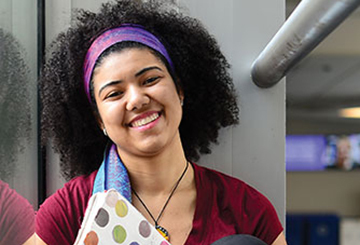 She attends one of the world’s most diverse colleges, where she strives and reaches further. 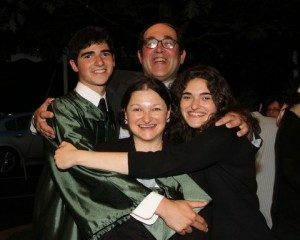 Karla sees herself as a leader and an ambassador, representing the East Coast, America, and Orthodox Jewry.